Banner at UW-Madison, April 2015. Each April a group of people committed to ending all use of animals for any purpose, including medical and scientific research, orchestrate events for a week they designate World Week for Animals in Laboratories (WWAIL). Among the primary objectives of WWAIL is to generate media coverage via picketing and protests. The event often culminates in World Day for Animals in Laboratories (WDAIL). Sit-in at UW-Madison during WWAIL (April 18, 2015). SAEN is like other absolutist groups whose position is that no matter what potential benefit the work may result in, no use of animals is morally justified. This extends across all animals – from fruit-fly to primate. Furthermore, all uses of animals, regardless of whether there are alternatives and regardless of the need, are treated identically. In other words, the use of a mouse in research aimed at new discoveries to treat childhood disease is considered morally equivalent to the use of a cow to produce hamburger, the use of an elephant in a circus, or a mink for a fur coat. WWAIL protests are focused specifically on research. Thus, the sites for protest tend to be universities and other research institutions where scientists engage in work that produces the new knowledge and discoveries that drive scientific and medical progress to benefit humans, other animals, and the environment. The protests also target individual scientists with the kind of “home demonstrations” we’ve written about before (see more here and here). In some cases the protests target businesses that support animal research. First, the primary objective appears to be media coverage. In fact, a quick view of the “successes” claimed by the primary organizing group shows that number of news stories is the prize accomplishment. Second, the number of people participating in the activities is typically a few to a dozen. Third, most of the materials used in the protests, social media coverage, and news releases reliably rely on outdated, out-of-context images and little reference to the protestors’ broad agenda and position. We agree that public consideration of animal research is important. Stimulating serious, thoughtful education efforts and inclusive public dialogue about science, public interests, medical progress, and animal research are critically valuable to public decision-making and, ultimately, to global health. Informed decisions based in accurate information and in an understanding of the complex issues involved in animal research are in the best interest of the public, science, and other animals. For that reason, many scientists, universities, educators, advocacy groups, and individuals engage in public outreach, education, and dialogue about scientific research with nonhuman animals. Their goal is to provide the public with accurate and thoughtful information about the range of issues that bear on decisions, policies, and practices related to animal research. Among those topics are: how science works, its process, timescales between discovery and application, why animal research is conducted, in absence of alternatives; who benefits and what would be lost if it did not occur; how animals in research are cared for, how ethical review occurs, and how regulation and oversight function. None of these are simple issues, which is why there are many websites, books, articles, and interviews on the topic. WWAIL provides a unique opportunity for the research community to help point people towards these resources for education, dialogue, and serious consideration of animal research. At the University of Wisconsin-Madison, we have one example of how to do just that. 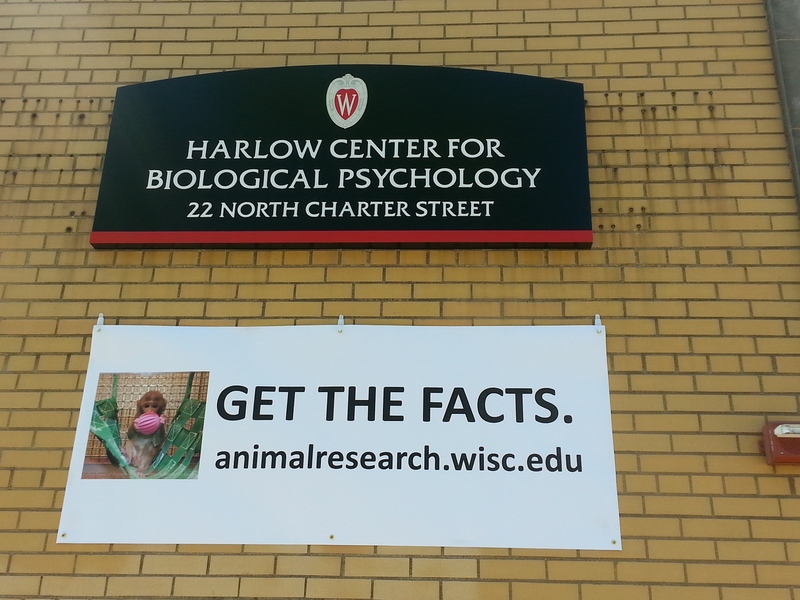 The website referenced in the banner shown in the photos here (animalresearch.wisc.edu) provides extensive information about animal research. The site provides facts, interviews, videos, photos, and links for those interested in learning more about why animal studies occur, the role that they play in scientific and medical progress that serve public interests, how research is conducted, its ethical consideration, and the practices, policies, regulation and oversight that govern animal care. By contrast, we have the signs held by those below participating in a WWAIL sit-in at UW-Madison on Saturday. Among the signs are photos of animals from other decades and other countries. 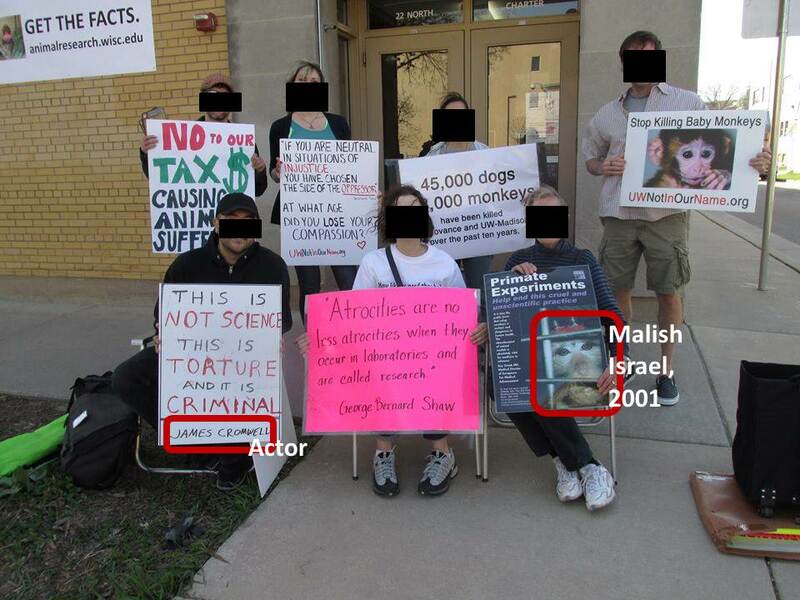 For example, note the repetitive use of a picture of Malish, a monkey who was involved in research in Israel in 2001 (not exactly relevant to UW). We also see quotes by an actor and numbers that do not reflect those from UW-Madison. None of these are difficult errors or misrepresentations to correct; but they probably won’t be corrected in absence of voices and sources to provide accurate information. Sit-in at UW-Madison during WWAIL (April 2015). This year, if your university or facility is among those that attract attention during WWAIL, we ask that you join in the conversation by providing protestors, public, and media your own voice. Whether it is via banners, websites, or talking with reporters– speak up for science and for public interests in advancing scientific understanding and medical progress. Although it may not matter to those committed to an absolutist agenda, it can matter to those who are interested in building a dialogue based in fact and serious consideration of the complex issues that surround public interests in the future of science, health, and medicine. 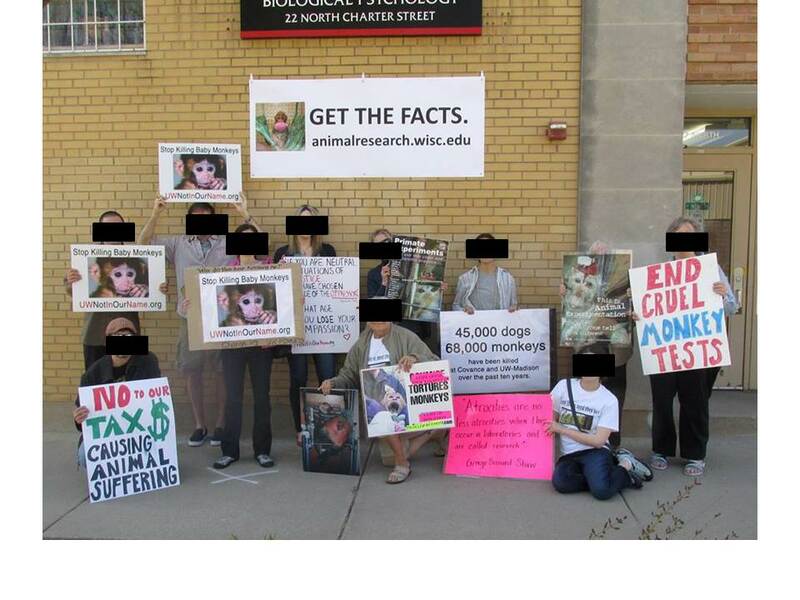 Posted on April 20, 2015 April 22, 2015 by EditorPosted in #ARnonsense, Animal Rights News, NewsTagged Alliance for Animals, Allyson J. Bennett, animal research, animal rights, animal rights activists, animal testing, speaking of research, Stop Animal Experimentation Now, University of Wisconsin-Madison, WWAIL. Reblogged this on Excellence In Animal Science.